The only people who are going to buy it are going to be very rich people who are going to park it outside their townhouse for ostentatious show of how virtuous they are while they drive around in their Cadillac Escalade. This is a classic example of what happens when the political and ideological desires of an administration are imposed on a private company. That’s how the Soviets worked it with the five year plan, and it didn’t work. It’s not how many jobs you create or even save, it’s can you sell a product in the market that will make a profit. Otherwise, it’s a farce. 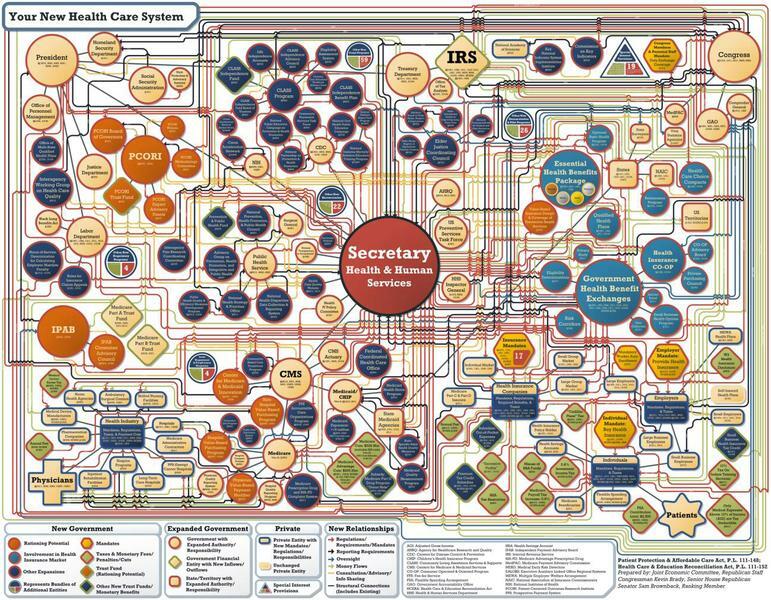 A chart produced by the Joint Economic Committee shows the governmental labyrinth of ObamaCare that will insidiously be imposed upon us. Its tortuous complexity is the manifestation of diseased thinking. It is deliberate and highly immoral. Those responsible, from The Zero on down, should never be forgiven. John has never been one to cave into political pressure from his musical colleagues. He ignored an artist boycott of Israel in June over the flotilla fiasco and played a show in Tel Aviv. He also played Rush Limbaugh’s latest wedding reception in early June, which drew the ire of gays and lesbians. Limbaugh is vehemently anti-gay marriage; John is married to his longtime partner David Furnish. I think most of our problems transcend politics, which is increasingly a reflection of an elite, insider culture that is completely at odds with the majority of the country that it oversees. So what is a cultural elite? It is a sloppy term that might include the academic class in the university that educates our children in college. The upper echelons that run government departments constitute part of this cultural elite. So does an entertainment cadre that oversees television and Hollywood. Corporate managers are elites as well. There is no racial, regional, religious, or tribal commonality. One shared allegiance perhaps is to higher education that certifies the cultural elite by diplomas of all sorts from a “good school,” as well as a respectable salary and a nice home with appurtenances. The good life of the elite is defined by both the absence of worry about necessities, and a certain status that accrues from properly recognized advanced education and sensitivity. How would we characterize the new aristocracy? In a number of ways. 1) Untruth. One requisite to being a cultural elite, unfortunately, is a certain allegiance to untruth, to saying one thing and doing another. Consider the manifestations of falsity from ecology to race. Often exempt from worry over a weekly check, and distanced from the mechanics of how things work, the elite clamors for a green cap-and-trade revolution. It rejects compromise with a fossil fuel near future that would transition us in a half-century or so to renewable energy. That said, it is hard to find cultural elites who live green lives. Most use their money at times to fly on jets or boat (like the president this weekend). As in the manner of the tastes of a John Edwards or Al Gore, the bigger and more impressive the home, the better to contemplate how lesser others use too much carbon-based power. Usually green sacrifice is to be made by coal miners, oil drillers, and timber men of politically incorrect industries — the distant horny-handed classes whose unmentioned work brings us instant convenience. In short, money, privilege, and status create in the cultural elite both a fear of mixing it up with others that might jeopardize position and placement, and yet guilt for that very sense of entitlement and exemption. All that, in turn, only heightens the shrill and sanctimonious rhetorical demands on less blessed others to prove their morality. Barack Obama was a genius in recognizing all this, and at a very early age no less. The subtext of Dreams from My Father, and indeed Obama’s life from 18 to 45, was to allay elite fears, guilt, and suspicions. And by proving to be a calm, charismatic, minority wannabe fellow elite — who could ipso facto offer instant penance for rather isolated and shamed cultural elite s— Obama in return grasped that the rules simply would not apply to him (elites having few real unchanging principles and values): graduate admission without commensurate grades and test scores (their release to the public could in theory prove my hypothesis wrong), law review without a paper trail, teaching and offers of tenure at law schools without normal publication, community organizing without worry of tangible results, running for office without repercussions from tawdry attacks ranging from suing to invalidate petitions to leaking divorce records. 2) Nature. The cultural elite class tends to romanticize nature, since it has little contact with it. Energy Secretary Steven Chu cheaply announces that California farms will dry up and blow away, with no clue how the tomatoes in his salad or the lamb chops on his plate are grown, cleaned, shipped — and land in his mouth. The elite like big hiking boots and four-wheel-drive SUVs that can go anywhere, and — once that is exhibited — usually stick to the hallways and freeways. The further the distance from nature, the greater the desire to experience it vicariously, symbolically, or representationally. The more we don’t clean and eat the fish we catch, the more we don’t know an apple from a cherry tree, so the more we idolize something like a three-inch Delta smelt and shut down 500,000 acres of icky distant irrigated land to ensure the minnow-like, but beloved, fish has enough oxygenated water in the California delta. 5) Logic. There is little logic among the cultural elite, maybe because there is little omnipresent fear of job losses or the absence of money, and so arises a rather comfortable margin to indulge in nonsense. The idea that taxes cause scarcity, and subsidy abundance is a foreign concept. The notion that entitlements create dependency is considered Neanderthal. Tough penalties supposedly do not deter crime. Abroad, military preparedness or deterrence pales in comparison to “soft” diplomatic power and clever talking. Borrowing trillions is “stimulus” and need not quite be paid back. In other words, take a deep breath and imagine the opposite of everything you know by experience to be true, and you have mostly the worldview of the sheltered cultural elite, who navigate in rather protected channels and not in the open seas of the real world. At a time when the American people need to make some decisions about the nation’s purpose, along comes Barack Obama to make the choices crystal clear. In one corner of the world you have Europe, beset by a sovereign debt crisis that’s been building for 50 years. The U.K.’s new prime minister, David Cameron, promises his people years of austerity to dig out from beneath their debt. Americans, staring at fiscal crevasses opening across Europe, have to decide if they also wish to spend the next 50 years laboring mainly to produce tax revenue to pay for public workers’ pensions and other public promises. The private sector would exist for the public sector. In another corner of the world, wealth is rising from the emerging economies of the east—China, India, Korea and the rest—posing America’s greatest economic challenge in anyone’s lifetime. Do the American people want to throw in the towel, or do they want to compete? If the latter, the public sector has to give way to the private sector. Now the clarifying gods have delivered a gift for the November election, the fight over taxes. Somewhere, George W. Bush must be laughing. Amid 9.5% unemployment, Democrats must deal with the expiration of the 2001 and 2003 tax cuts. They are trying to thread this needle by pushing a “middle class” extension through the hole, while impaling “the rich” on a tax spike. This election and these times are a chance to put to the voters opposed visions of why we work and what we do with the money we earn. If voters ultimately feel more secure with a Barack Obama and the like designing a national itinerary for some 300 million people in 50 states, then certainly one should vote for letting taxes rise now on one class of Americans and imposing a VAT next year on everyone. They need a whole lot of money, so give it to them to the horizon. We work, they decide. The alternative vision is that to compete for the next 50 years, the U.S. is going to need a tax structure that keeps more of the nation’s decisions about using its wealth in the hands—and minds—of millions of intelligent citizens, from any economic class. They work, they decide. Bush says researchers need a campaign that inundates the public with the message of science: Assemble two groups of spokespeople, one made up of scientists and the other of celebrity ambassadors. Then deploy them to reach the public wherever they are, from online social networks to “The Today Show.” Researchers need to tell personal stories, tug at the heartstrings of people who don’t have PhD’s. And the celebrities can go on “Oprah” to describe how climate change is affecting them—and by extension, Oprah’s legions of viewers. While nobody would dispute the value of a good PR department, we doubted that bad or insufficient PR was the primary reason for the public’s declining trust in scientific pronouncements. Our theory is that science is not losing its credibility because people no longer like or believe in the idea of scientific discovery, but because science has taken on an authoritarian tone, and has let itself be co-opted by pressure groups who want the government to force people to change their behavior. In the past, scientists were generally neutral on questions of what to do. Instead, they just told people what they found, such as “we have discovered that smoking vastly increases your risk of lung cancer” or “we have discovered that some people will have adverse health effects from consuming high levels of salt.” Or “we have found that obesity increases your risk of coronary heart disease.” Those were simply neutral observations that people could find empowering, useful, interesting, etc., but did not place demands on them. In fact, this kind of objectivity was the entire basis for trusting scientific claims. Ever more risibly desperate become the efforts of the believers in global warming to hold the line for their religion, after the battering it was given last winter by all those scandals surrounding the UN’s Intergovernmental Panel on Climate Change. One familiar technique they use is to attribute to global warming almost any unusual weather event anywhere in the world. Last week, for instance, it was reported that Russia has recently been experiencing its hottest temperatures and longest drought for 130 years. The head of the Russian branch of WWF, the environmental pressure group, was inevitably quick to cite this as evidence of climate change, claiming that in future “such climate abnormalities will only become more frequent”. He didn’t explain what might have caused the similar hot weather 130 years ago. Meanwhile, notably little attention has been paid to the disastrous chill which has been sweeping South America thanks to an inrush of air from the Antarctic, killing hundreds in the continent’s coldest winter for years. In America, the National Oceanic and Atmospheric Administration (NOAA) has been trumpeting that, according to its much-quoted worldwide temperature data, the first six months of this year were the hottest ever recorded. But expert analysis on Watts Up With That, the US science blog, shows that NOAA’s claimed warming appears to be strangely concentrated in those parts of the world where it has fewest weather stations. In Greenland, for instance, two of the hottest spots, showing a startling five-degree rise in temperatures, have no weather stations at all. A third technique, most familiar of all, has been to fall back on the dog-eared claim that leading sceptics only question warmist orthodoxy because they have been funded by “Big Oil” and the “fossil fuel industry”. Particularly bizarre was a story last week covering the front page and an inside page of one newspaper, headed “Oil giant gives £1 million to fund climate sceptics”. The essence of this tale was that Exxon Mobil, the oil giant that is the world’s third biggest company, last year gave “almost £1 million” to four US think-tanks. These had gone on to dismiss the Climategate inquiries as “whitewashes”. It was hardly necessary to be given money by Exxon to see what was dubious about those inquiries. Not one of the knowledgeable sceptics who have torn them apart has received a cent from Big Oil. But what made this particularly laughable was that the penny-packets given to think-tanks that have been largely irrelevant to the debate are utterly dwarfed by the colossal sums poured into the army of groups and organisations on the other side of the argument. Even the big oil companies have long been putting their real money into projects dedicated to showing how they are in favour of a “low-carbon economy”. In 2002 Exxon gave $100 million to Stanford University to fund research into energy sources needed to fight global warming. BP, which rebranded itself in 2004 as “Beyond Petroleum”, gave $500 million to fund similar research. The Grantham Institute provides another example. It was set up at the LSE and Imperial College with £24 million from Jeremy Grantham, an investment fund billionaire, to advise governments and firms on how to promote and invest in ways to “fight climate change”, now one of the fastest-growing and most lucrative businesses in the world. Compare the funding received by a handful of think-tanks to the hundreds of billions of dollars lavished on those who speak for the other side by governments, foundations, multinational corporations, even Big Oil, and the warmists are winning hands down. But only financially: they are not winning the argument.